11 days have gone by since I had surgery. For the first time in five years I am pain free. I can't describe how wonderful it feels. This afternoon I go for my post surgery check-up. I hope today is the day they remove the staples. Those 23 little buggers are irritating! I missed the Bead & Button show. Heather had a booth this year. Her Humblebeads look delightful filling the white dishes as part of her display. My son Ray couldn't resist the five hour drive to Milwaukee to visit with his sister. I can't wait to hear the tales Rosanne and Heather will share of their show experience. I had a few beady surprises of my own last week. 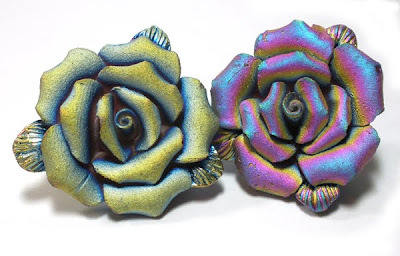 Sally picked up these beautiful ceramic Raku flower at Turquoise Coyote. 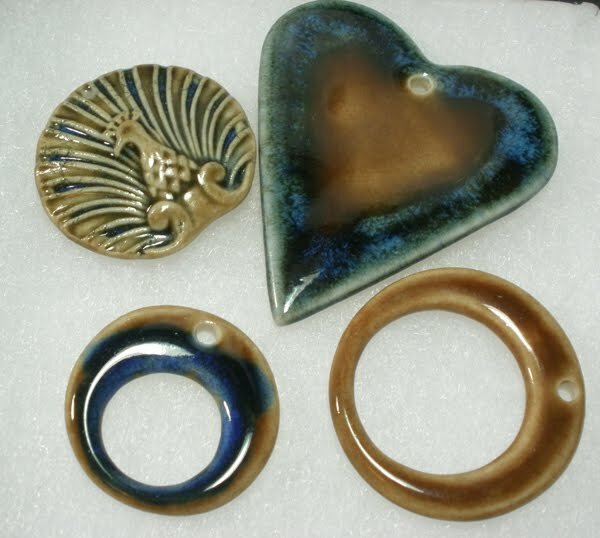 Rosanne sent these wonderful ceramic pendants created by Nancy of Round Rabbit. Thanks to all who sent well wishes and prayers. I am working on getting back into the swing of things. I had no idea - but it is wonderful to hear you are without pain and feeling good! Wishing you well and hope you get the staples out! I am so glad you are now pain free. I cannot believe how long you have suffered with this and I am so so happy to hear good news! Have been waiting for the good word! Look forward to seeing the new Bev ! Good news that you are feeling better! I can relate to those pesky itchy staples. Hope they are out. Hi, great news about you being pain free now! My prayers and thoughts are with you! Awesome beady surprises to. I hope that you have a wonderful new week! Great news! Have a great week. I'm looking forward to seeing what you do with you new stash of treasures. Glad to hear that you are doing much better - it's been a long road. It was different not seeing your smile at the show, but a hug from Heather and words with Rosanne were good. Heather's booth was nice and bright - very nice. Thank you all for the well wishes. The staples came out yesterday. Yahoo what a difference. Now I just have to be careful not to lift anything heavy yet. Erin I was looking forward to meeting you this year. 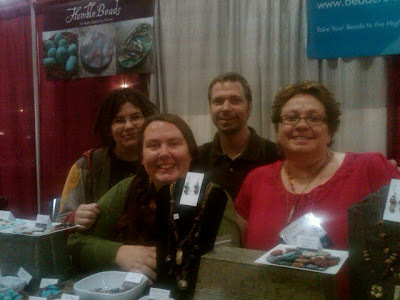 Next year I will be at the Bead & Button show! Liz I am jealous of all those crystals I saw you bought on facebook! Hope you are feeling better! I have never been to the B&B show, myself... Maybe I will make it there at some point in my lifetime! Wish I would have known sooner that you were having surgery, Bev. But I am so glad to hear that you are feeling and doing so well.